This year, our volunteers traveled from 43 states to Washington, DC, to participate in this opportunity for advanced training, and to be more effective bridges between their communities and their representatives in the United States Congress. We also had attendees from Canada, Spain and England. One of the conference highlights was the surprise global Fuze meeting we hosted, at 9:00 am on Monday morning. Just after opening the general session, Mark Reynolds asked me to come on stage, plug in my laptop, and allow our entire conference to visit with new local leaders around the world. In that video conference, we had Lars from Sweden, Rashedul from Dhaka, along with Nils, Bärbel, Kathrin and Seunghye, in Berlin, and Danilo from Zug, Switzerland; we had Judy in Marlborough, England, and Clive in London, and, of course, the incomparable Sieren in Brussels. From across Australia, we were joined by Rod from Hasluck, Ron from Perth, John from Brisbane and Lauren in the capital, Canberra. The ever inspirational Cathy Orlando, our national leader for Canada, joined from her home in Sudbury, Ontario. One by one, each of our global leaders said hello and gave their name and location, and received an ovation from the entire conference. They beamed with a mix of joy, humility and pride, and many in the room have since told me it was one of the most emotional moments they remember experiencing in years. Educating people about climate policy, about carbon pricing, border adjustments and negative externalities, isn’t just about data, economic theory and political process; it’s also about making human connections. 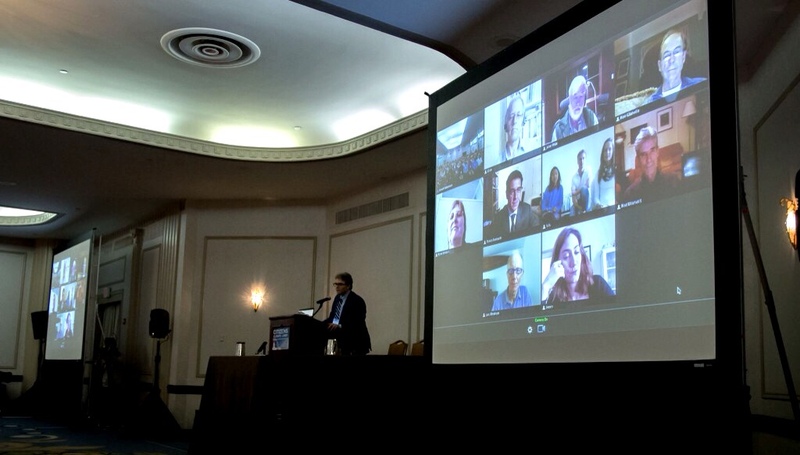 That global video conference let CCL do what it does best: bring people together to work as small, dedicated teams with a mission of service to the wider world. The night before we received a far-ranging education in the agricultural dynamics of the climate crisis from Tara Ritter: both how agriculture is being affected by ongoing climate change, and also how we can do better, to build a future that works for farmers and where farming practices do better in their use of energy. Tara explained the decline in energy productivity over the last 75 years: in 1940, 1 calorie of energy generated 2.3 calories of food; now, it takes 10 calories of energy input to generate 1 calorie of food energy. That means we are now 23 times less efficient at turning energy into food. As we move to more efficient energy-use and energy-production practices, we can improve such inefficiencies and build value across our economy. add $70-$85 billion per year to US GDP, totaling $1.375 trillion after 20 years. Then Bob Inglis—former Republican Congressman from South Carolina, who boldly proposed a revenue-neutral carbon tax bill, when the House and Senate were considering Cap and Trade legislation in 2009 and 2010—addressed the general session. A real thought-leader and principled public servant, Inglis has said elsewhere he just didn’t get the issue, during the partisan division of the 1990s. It was his family, and a trip to Antarctica, that made it clear to him that his deep personal faith required him to rise to the responsibilities of smart and moral stewardship, for the benefit of life and to fulfill an ethical obligation to future generations. His message broadens the political space for action to mitigate climate destabilization, and his insights provide a unique and powerful education to our volunteers. After his speech, the former Congressman, who now directs the Energy and Enterprise Initiative, graciously gave his time to a group of conservative-minded CCL volunteers, who laid out their case for a revenue-neutral carbon price. He commented on their work, their language and their approach, and provided still more detailed insight into how to bridge the divide between the scientific motivation and the skeptical mindset. It just so happened that Pres. Obama was attending another conference at the same hotel, so the entire neighborhood was secured by the Secret Service, and at lunch, a number of our volunteers had occasion to see him walking to lunch, and then to shake his hand at Chipotle. Cheryl, from Toronto, made sure to let him know “I’m from Canada”, possibly the most celebrated three words of the conference. Somehow, I think it was important to our volunteers that while the President was in the vicinity, we actually had world-changing work to do, and so coming back from lunch, we got down to business. The afternoon featured breakout sessions, on everything from fundraising to local group management, Spanish-language outreach, agriculture and clean energy technology. I gave my “Building a Green Economy” talk, the latest update, a flurry of information and conceptual framings that helps to bring the future economy into focus: it’s always fun to do, and elicited some very good questions from our well-informed volunteers. The breakout sessions provide a real opportunity to go deeper into the issues that relate to or show the value of a carbon fee and dividend plan, and they provide added clarity and confidence to volunteers who are still somewhat new to articulating the particulars of complex policy prescriptions. By the end of the day, we had collectively spent about 7,200 hours learning more detail about matters of policy, sharing information and resolving details of our organizing back home as local chapters and state-wide teams. As Mark Reynolds has noted on a number of occasions, it was amazing to experience what happens when you ask how many people in the room understand border tax adjustments: when we asked 600 CCLers that question, virtually every hand went up. That might seem like an esoteric detail of policy unrelated to most people’s everyday way of thinking, but there is something very special about a team of that size where so many people have committed to understanding such a thing. It makes us stronger as advocates and better at the role of serving the public interest. Building a livable future means committing to engaging deliberately enough to understand how such matters affect us in our everyday context. Carrying on a steady campaign of engaged, principled civics means getting interested, getting educated, and getting involved. It also means getting outside your “comfort zone”, where most of us spend most of our time. We don’t generally spend our afternoons talking to people about how to adjust the dynamics of the US economy to favor efficient alternative energy solutions or to Senators and House Representatives about how to write laws that would do so. To step into that role, to elevate our citizenship to that level, and to do so with diligence, respect for difference of opinion and an understanding of how to build consensus—that requires getting outside of the comfortable and into the place where new and surprising alliances become possible. In one of the breakout sessions, Ashley Hunt-Martorano told volunteers that in fundraising, we are rewarded for stepping outside our comfort zone and for taking on big challenges. The first reason is because most people don’t like asking other people for money (it seems impolite); the second reason is because people like to reward people who take on a challenge. One example of this is the Climate Ride: Ashley, Sieren, Erica, Danny and I, and others from CCL over the years, have had the experience of finding friends and relatives willing to donate to our organization, because we cycled 320 miles. Even the most prodigious fundraisers, when raising money from small donors, find that doing something challenging brings in well more than twice the donations. Ashley used the example of karaoke, to illustrate the other point: that fundraising can be uncomfortable, but overcoming your fear of asking the question can lead to positive results. She used the example, because singing in public is terrifying to her. She didn’t expect to be challenged to sing karaoke; it was just an example. But as is the way with CCL, a good idea gets set in motion, and volunteers take up the challenge. Bart, from Columbia County, NY, challenged Ashley to sing if he could raise $250 by 7:00 pm. He raised $275, and Ashley, through much emotional turmoil, stood up and faced her fear of singing in public. She had support, and a hat was passed, and she was rewarded for her bravery, as she raised another $229, for a total of $504 in roughly 3 hours, for four minutes of karaoke, and for a good cause. Throughout the day, I received congratulations and gratitude from volunteers who were moved by the global Fuze meeting in the morning session. People were emotional and inspired. 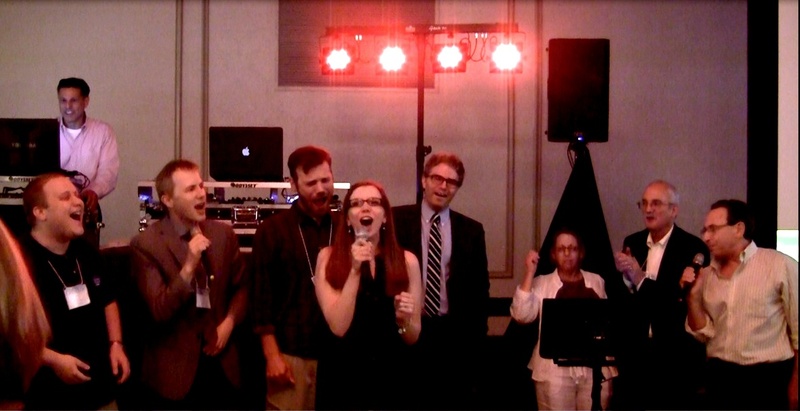 Ashley’s performance—and the intense emotion with which she committed herself to the principle of participatory civics, on that occasion in the form of karaoke fundraising to support participatory civics—had a similar effect. A lot of eyes were misty and a lot of hearts were feeling engaged and connected. Monday was a great day of learning, a day which vastly enhanced the overall knowledge of our national network of local teams; it was also a day of intense and successful team-building. Most of us, for many years, have worked with deep feeling and commitment to raise awareness about the climate crisis and also about the remarkable opportunities we have for bold, imaginative, regenerative solutions. To now be working with such a committed, high-quality, always active team of volunteers, across the world, is a privilege and one which leads to the release of a lot of tension and energy. That feeling would carry us into and through our biggest day on Capitol Hill to date.